Okra has been used throughout history for both culinary and medicinal reasons. That being said, some people fail to appreciate it due to its slimy texture. However, okra nutrition facts set this nightshade vegetable apart as a nutritional powerhouse. Okra’s plant name is Abelmoschus esculentus or Hibiscus esculentus. It comes from the Malvaceae or mallows family, and it related to hibiscus, hollyhock, and cotton. Okra is known by several names. This includes lady’s fingers due to its long shape. Other names include ochro, okro, bendakai, Kacang bendi, and gumbo, which comes from a Portuguese version of the word “quilobo” called “quingombo.” It is also called “Bhindi” in India, and “bambies” in Arab and Eastern Mediterranean countries. Okra is also a pod vegetable that is available year round, especially in the summer, because it thrives in warm climates. The pod will grow two to six inches long, and one inch in diameter. When it is ripe, it opens in five different places, and will discharge several heart-shaped seeds. It is naturally green, but some varieties are red. Some types are smooth, and others have a rough texture. It is tough to chew, and therefore it is best to steam, sauté, or boil it before eating. Some of the world’s most powerful women loved to eat okra, including Cleopatra of Epypt and China’s Yang Guifei. French colonists in Louisiana likely introduced it to the U.S. in the early 1700s, and it was grown as far north as Philadelphia in 1748. A number of gardeners had written about this nutritious vegetable as early as 1806. Okra is a powerhouse of important nutrients, and its buds, fresh leaves, stems, pods, and seeds all have value. What are its nutrition facts? A half-cup of cooked and sliced okra contains 2 grams of fiber and 1.5 grams of protein. Approximately half of its nutrition comes from a soluble fiber in the form of pectins and gums. As for its micronutrient content, okra is also an excellent source of vitamin K, vitamin A, manganese, and folate. It also contains small amounts of magnesium, calcium, phosphorus, potassium, iron, copper, zinc, selenium, vitamin A, vitamin E, vitamin B1, vitamin B2, vitamin B3, vitamin B, vitamin B6, and choline. The following is an okra nutrition chart that contains information for a half-cup of cooked and sliced okra, which is about 80 grams. There are many health benefits of okra due to its high nutrient content. It is no wonder that the ancient crop has been used as medicine for hundreds of years. The leaves were used for urinary problems and pain relief. Today, in Turkey, the leaves are still used to reduce or soothe inflammation. In the Congo, it was a remedy to help mother with a safe pregnancy. In Malaysia, the root has been used to treat syphilis. Okra is also used for those with depression, fatigue, stress, and weakness. It can also add bulk to stools, and help detoxify the liver of toxins. It benefits people with atherosclerosis, cataracts, acid reflux, multiple sclerosis, colorectal cancer, and lung inflammation. The following is a more detailed look of the okra health benefits. The fiber and other nutrients in okra help normalize blood sugar levels. It will regulate the rate that sugar is absorbed from the intestinal tract. The seed in particular contains qualities that normalize blood sugar and lipid profiles that may help treat diabetes. A study published in the Journal of Pharmacy & BioAllied Sciences in 2011 found that subjects fed ground and dried okra seeds and peels would experience a decrease in blood sugar levels. Meanwhile, others had a gradual reduction in blood sugar after being fed its extract for a 10-day period. Roasted okra seeds have also been used as a diabetes treatment for generations. Okra’s vitamin C and antioxidant content will boost the immune system and fight against free radicals. Vitamin C stimulates the immune system through the creation of more white blood cells to fight foreign pathogens in the body. Also, a protein in okra called lectin would reduce cancer growth by 63%, according to a review published in the Saudi Pharmaceutical Journal in 2012. The lectin would also kill 72% of the cancer cells. Okra also has the power to lower cholesterol levels. The soluble fiber in it will naturally decrease cholesterol, and can therefore reduce heart disease risk, according to some studies. The pectin in it will also bind excess cholesterol and toxins in the bile acids within the intestines. This makes it easy to eliminate, which prevents many health problems. About one in 12 Americans suffers from asthma, and it the most chronic childhood condition. Symptoms include chest pain, shortness of breath, coughing, and wheezing. The vitamin C in okra is important for treating respiratory issues like asthma. Studies have found that foods high in vitamin C may have a protective effect against wheezing symptoms in children. Finally, regular consumption of okra may help prevent kidney disease. In a study published in Jilin Medical Journal in 2005, researchers found that those eating this vegetable daily would reduce signs of kidney damage better than those eating simply a diabetic diet. This is also useful for diabetics, as diabetes causes about 50% of kidney disease cases. You would think with all those okra health benefits, that it would be a staple in the average American’s diet. The problem is, most people don’t know how to prepare it. Okra is most often boiled, but it can also be eaten raw, grilled, streamed, fried, sautéed, roasted, or battered. The okra plant fruits can also be ground into powder, or preserved from drying or pickling. Okra is most popular in dishes known in Louisiana, especially with Creole cooks from New Orleans. There are many recipes available for curries, stews, sauces, soups, and salads. Ripe okra seeds are also sometimes roasted and ground as a coffee substitute. Okra is also sometimes cooked similar to green peas, and served as a salad with French dressing. It is also used to make gumbo soups, and the young pods provide excellent flavor and a pleasant consistency. You will often find okra paired with other vegetables, or in soups or stews. Maybe you were turned off by okra’s slimy texture? The following is a simple roasted okra recipe side dish that may make you change your mind about okra. Preheat the oven to 400°F. Cut the tops off the okra, slice lengthwise, and place on a large baking sheet lined with parchment paper. Drizzle with olive oil or coconut oil, and toss to coat. Sprinkle with garlic powder, salt, pepper, and other preferred spices. Bake for 18 to 22 minutes until they are soft, and beginning to brown on the ends. It is now ready to serve. Okra also tastes great with other vegetables included. Here is another okra recipe with a variety of other vegetables and spices that are sure to satisfy your taste buds! Preheat the oven to 425°F. Wash and chop all the vegetables. Grease a large baking sheet with some sesame oil, and place chopped veggies onto the greased baking sheet. Mix the honey, sesame oil, cinnamon, and massage and spread evenly on the veggies. Sprinkle on pepper and sea salt. Bake for 30 minutes. Remove from oven, and flip the veggies, and bake for another 35 to 40 minutes, until they are golden brown and slightly crispy. At this point they are ready to serve. When made right, okra is definitely delicious and will be a welcomed addition to any healthy diet. However, there is one note of caution when cooking okra. The United States Department of Agriculture (USDA) states iron, copper, or brass cookware should not be used while preparing okra because metal will be absorbed. As a result, cooking should be done in earthenware, porcelain, or agate. Eating okra while taking the diabetic drug, metformin, may also lower the drug’s effect. Also, since okra contains oxalates, over-consumption may produce a kidney stone risk in some people. The fructan in okra can also induce cramps, bloating, and diarrhea in some individuals. Those with irritable bowel syndrome should avoid eating okra. “Okra, cooked, boiled, drained, without salt Nutrition Facts & Calories,” SELF NutritionData; http://nutritiondata.self.com/facts/vegetables-and-vegetable-products/2498/2, last accessed February 9, 2017. 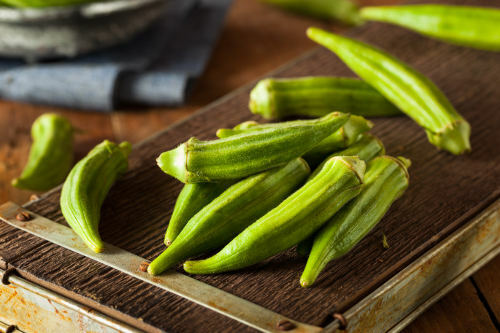 Borreli, L., “What Is Okra (Lady’s Finger) and 6 Benefits of Adding The Medicinal Vegetable to Your Diet,” Medical Daily, September 2, 2015; http://www.medicaldaily.com/what-okra-ladys-finger-and-6-benefits-adding-medicinal-vegetable-your-diet-350750. “What Is Okra Good For?” Mercola; http://foodfacts.mercola.com/okra.html, last accessed February 9, 2017. Watson, K., “Benefits of Okra for Diabetes,” Healthline; http://www.healthline.com/health/diabetes/okra, medically reviewed on January 26, 2016. “Okra nutrition facts,” Nutrition-and-you; http://www.nutrition-and-you.com/okra.html, last accessed February 9, 2017. Barrett, M., “Over 6 Health Benefits of Okra, Plus Growing Tips,” Natural Society, February 11, 2013; https://naturalsociety.com/6-okra-health-benefits-growing-cooking/. “Roasted Okra Recipe,” Wellness Mama; https://wellnessmama.com/23615/roasted-okra-recipe/, last updated December 30, 2016. Alqasoumi, S.I., et al., “‘Okra’ Hibiscus esculentus L.: A study of its hepatoprotective activity,” Saudi Pharmaceutical Journal, April 2012; 20(2), 135-141; doi 10.1016/j.psps.2011.10.002. Ke-hui, L., et al., “The clinical research of Okra in treatment of diabetic nephropathy,” Jilin Medical Journal, 2005; http://en.cnki.com.cn/Article_en/CJFDTOTAL-JLYX200510009.htm. “Okra Nutrition: Improve Heart Health, Eyesight & Cholesterol Levels,” Dr. Axe; https://draxe.com/okra-nutrition/, last accessed Feb. 9, 2017.